The Doric column is an architectural element from ancient Greece and represents one of the five orders of classical architecture. Today this simple column can be found supporting many front porches across America. In public and commercial architecture, notably the public architecture in Washington, DC, the Doric column is a defining feature of Neoclassical style buildings. A Doric column has a very plain, straightforward design, much more simple than the later Ionic and Corinthian column styles. A Doric column is also thicker and heavier than an Ionic or Corinthian column. For this reason, the Doric column is sometimes associated with strength and masculinity. Believing that Doric columns could bear the most weight, ancient builders often used them for the lowest level of multi-story buildings, reserving the more slender Ionic and Corinthian columns for the upper levels. Ancient builders developed several Orders, or rules, for the design and proportion of buildings, including the columns. Doric is one of the earliest and most simple of the Classical Orders set down in ancient Greece. An Order includes the vertical column and the horizontal entablature. Doric designs developed in the western Dorian region of Greece in about the 6th century BC. They were used in Greece until about 100 BC. Romans adapted the Greek Doric column, but also developed their own simple column, which they called Tuscan. Doric columns come in two varieties, Greek and Roman. A Roman Doric column is similar to Greek, with two exceptions: (1) Roman Doric columns often have a base on the bottom of the shaft, and (2) are usually taller than their Greek counterparts, even if the shaft diameters are the same. Since the Doric column was invented in ancient Greece, it can be found in the ruins of what we call Classical architecture, the buildings of early Greece and Rome. Many buildings in a Classical Greek city would have been constructed with Doric columns. Symmetrical rows of columns were placed with mathematical precision in iconic structures like the Parthenon Temple at the Acropolis in Athens: Constructed between 447 BC and 438 BC., the Parthenon in Greece has become an international symbol of Greek civilization and an iconic example of the Doric column style. Another landmark example of Doric design, with columns surrounding the entire building, is the Temple of Hephaestus in Athens. Likewise, the Temple of the Delians, a small, quiet space overlooking a harbor, also reflects the Doric column design. On a walking tour of Olympia you'll find a solitary Doric column at the Temple of Zeus still standing amid the ruins of fallen columns. Column styles evolved over several centuries. The massive Colosseum in Rome has Doric columns on the first level, Ionic columns on the second level, and Corinthian columns on the third level. When Classicism was "reborn" during the Renaissance, architects such as Andrea Palladio gave the Basilica in Vicenza a 16th century facelift by combining column types on different levels—Doric columns on the first level, Ionic columns above. In the nineteenth and twentieth centuries, Neoclassical buildings were inspired by the architecture of early Greece and Rome. Neoclassical columns imitate the Classical styles at the 1842 Federal Hall Museum and Memorial at 26 Wall Street in New York City. The 19th century architects used Doric columns to recreate the grandeur of the site where the first President of the United States was sworn in. Of less grandeur is the World War I Memorial shown on this page. 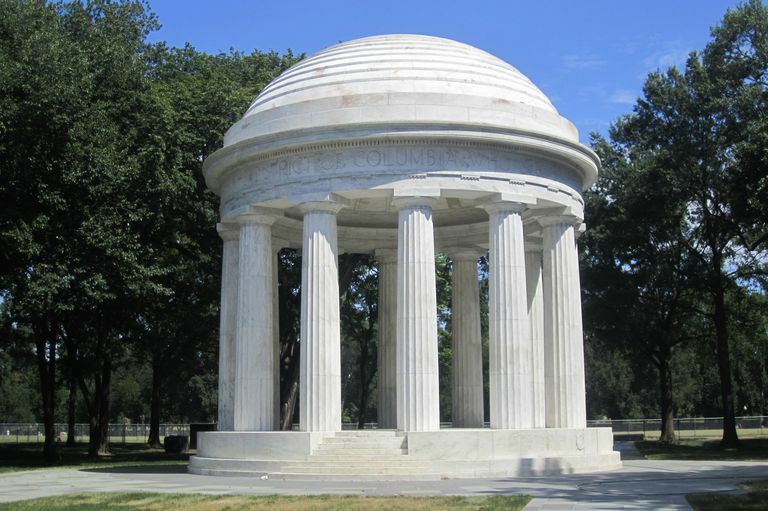 Built in 1931 in Washington, DC, it is a small, circular monument inspired by the architecture of the Doric temple in ancient Greece. A more dominant example of Doric column use in Washington, DC is the creation of architect Henry Bacon, who gave the neoclassical Lincoln Memorial imposing Doric columns, suggesting order and unity. The Lincoln Memorial was built between 1914 and 1922. Finally, in the years leading up to America's Civil War, many of the large, elegant antebellum plantations were built in the Neoclassical style with classically-inspired columns. These simple but grand column types are found throughout the world, wherever classic grandeur is required in local architecture. Doric column illustration © Roman Shcherbakov/iStockPhoto; Parthenon detail photo by Adam Crowley/Photodisc/Getty Images; Lincoln Memorial photo by Allan Baxter/Getty Images; and photo of Federal Hall by Raymond Boyd/Getty Images. What Is Longer Than It's Wide? 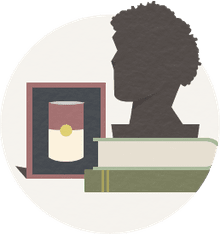 What's So New About Neoclassical?